Investors weren't fully convinced Tuesday morning that politicians in Washington would manage to hash out a plan to raise the U.S. debt ceiling and end the government shutdown. 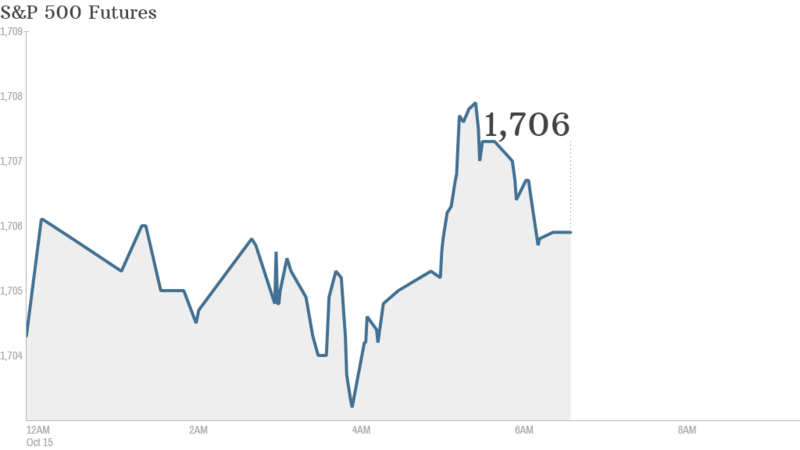 U.S. stock futures were barely budging ahead of the opening bell. Signs that Senate leaders were moving closer to an agreement to end the partial government shutdown and raise the country's debt limit pushed U.S. stocks higher Monday. But as the shutdown heads into its 15th day, there are concerns that Washington will struggle to pay all of its bills if a debt resolution isn't reached this week. Even if the Senate gets a deal, it still needs to win support in the House of Representatives, which is far from certain. Earnings season picks up Tuesday, with results due before the opening bell from Citigroup (C), Coca-Cola (KO), Domino's Pizza (DPZ) and Johnson & Johnson (JNJ). Yahoo (YHOO) and Intel (INTC) are set to report in the afternoon. Shares of Burberry (BBRYF) fell by nearly 4% after the company announced its CEO -- Angela Ahrendts -- would be leaving for a job at Apple (AAPL). European markets were pushing higher in morning trading, led by the FTSE 100 in London. "The fact that the European markets are all positive even with the looming deadline" of the U.S. government's debt limit is a "sorry perception on the sorry shenanigans of Washington," said Alastair McCaig, market strategist for IG in London. Most major Asian markets ended the day with modest gains, also based on hopes for a U.S. deal.